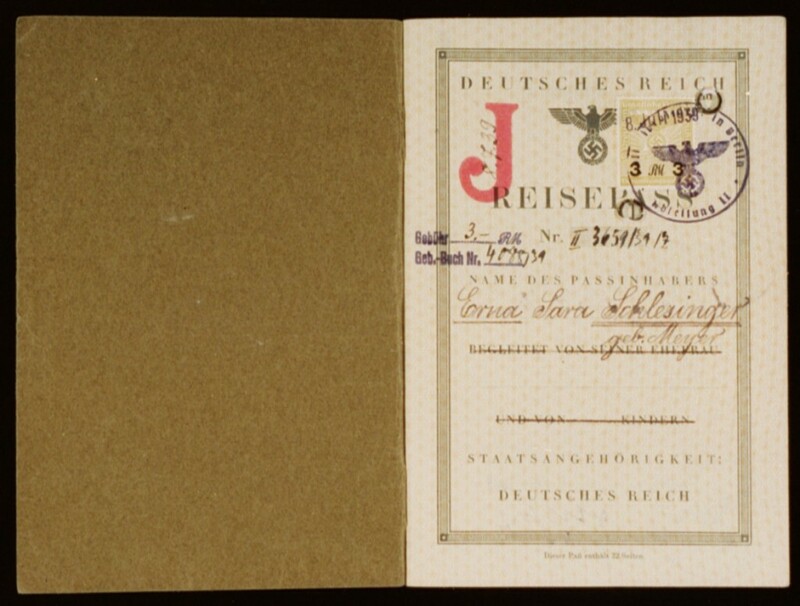 German police authorities issued this passport to Erna "Sara" Schlesinger on July 8, 1939, in Berlin. This first page of the passport illustrates the German laws that facilitated the identification of Jews in Germany. From 1938, German regulations required that Jewish women with a first name of "non-Jewish" origin use the middle name "Sara" on all official documents. Jewish men had to add the name "Israel". The letter "J" (standing for "Jude," that is, the word "Jew" in German) was stamped in red on the passports of Jews who were also German nationals. Erna Schlesinger emigrated to the United States in 1939.